The current overculture is filled with hair-tousling aphorisms about less sleep, more work. ‘Sleep is for the weak!’ ‘You can sleep when you’re dead!’ These aren’t just lighthearted ribs, though. Over the span of just 70 years, we’ve cut our average sleep time by almost 20%. This isn’t random—professionals attribute this loss in sleep to a variety of factors, including increased blue-light absorption, distractions from personal devices, and even being out of tune with nature’s ebb and flow thanks to central air and heat. March 15 is National Sleep Day, but you probably didn’t see an ad for it on your Instagram. It’s difficult to pin this on just one factor, but what’s certain is that our sleep patterns are shifting, and that might not be a good thing. Scientists have long drawn a link between sleep and mental health, such that their relationship is codependent. More than 50% of individuals seeking help for mental health-related issues also deal with sleep loss. Some have gone a step further, assessing lack of sleep as a cause, rather than a symptom, of mental illness. Regardless of the diagnosis, it’s clear that sleep and mental health are correlated—both in positive and negative ways. But another factor is the way that modern work culture has both exacerbated and commodified our lack of sleep. This messaging is related to something called ‘hustle culture,’ which some describe as “the complete abandonment of finding healthy work-life integration.” This culture is defined by words like grind, and phrases like ‘striving and thriving’—and of course, hustle. It describes a particular type of work that never ends; it glorifies working ‘round the clock (on the subway, when you get home, from your bed) and abandoning sleep (‘We run on coffee and sleep deprivation!’ as cutesy, team-building mantra) in the name of constant progress. But in this equation, it is worth asking who is progressing and ‘thriving,’ and who isn’t. The New York Times recently posed, “Why Are Young People Pretending To Love Work?” The crux of the critique, like most assessments of ‘hustle culture,’ looks at how employers use this language—coupled with appealing ‘perks’ like free coffee, a beer fridge, and a foozeball table!—to keep their workers motivated to work harder, faster, and later. Poking holes in hustle culture means recognizing that sleep is necessary if we’re going to ‘rise and thrive.’ We can’t truly ‘win all the time’ when we’re working off of one meal a day, four hours sleep, and six coffees; the winner in this equation is the person profiting from our nonstop labouring. So by all means, work hard; do the best work you can do. But don’t give up your sleep. It’s more important than the hustle. Each March brings with it an annual offer to reevaluate and recalibrate what it means to be ‘intelligent.’ Intelligence is a concept and a word that’s loaded with imagery: of a sharp, even-keeled, well-read, post-secondary-educated person, or a brainy, bespectacled, lab-coat-wearing tech prodigy. Intelligence is either attainable or unattainable based on how closely your brain’s function matches constructed ideals like these. While there are class-based concerns with who is or isn’t considered ‘intelligent’—not everyone can afford a post-secondary education—perhaps the more pressing concern can be revealed through a lens of ableism. Ableism is the term that describes discrimination based on ability or disability. For example, folks who use wheelchairs experience ableism when they can’t attend an event because the venue isn’t wheelchair-accessible. This is a broad example of a deep-reaching issue that stems from the fact that modern society has been constructed entirely around the experiences of ‘intelligent’ and able-bodied individuals. Disability-identified folks who do not align with this vision often face both latent and explicit institutional barriers to access. This includes people who live with developmental disabilities. Since 1987, the month of March has been designated as National Developmental Disabilities Awareness Month in the United States, a campaign for disability rights and consciousness-raising across the country. Most see the campaign as an imperative of sorts: to adjust our communities to meet the needs of disability-identified individuals. But it isn’t designed solely to affect the physical world—the campaign reminds us that these individuals have full, rich, nuanced, and diverse lived experiences. Ableist society is often structured such that these folks are viewed as inferior or in need of assistance, and while inclusive programming in our physical world is absolutely necessary, so too are inclusive understandings of what it means to live with disability. A key part of understanding ableism is understanding that it is this very discriminatory mechanism that prevents disability-identified folks from accessing the aforementioned full, rich, nuanced, and diverse lived experiences. If ableism (and, as a result, a world developed around ableism) didn’t exist—if all spaces were perfectly inclusive and accommodating for all disabilities—these individuals would be able to navigate the world without concern, and their experiences wouldn’t be defined by deficit or inaccessibility. While this paradigm-shift takes time, inclusive programming is an immediate and simple change to make that can benefit disability-identified folks in your community. This month, consider taking steps to ensure that spaces where events are held have accommodations for individuals who use wheelchairs and other mobility aids. For events with spoken components, look into hiring a sign language interpreter deaf folks, or for visual presentations, incorporate braille or tactile pieces that make the work accessible. These signal that all are welcome and considered. National Developmental Disabilities Awareness Month isn’t just about awareness-raising; it’s about combating institutional discrimination against disability-identified individuals, and that’s a fight that we should continue all year long. From February 25th to March 3rd, the National Eating Disorders Association (NEDA) will be highlighting its fight through National Eating Disorders Awareness Week. This year’s theme: Come As You Are, a theme dedicated toward inspiring body acceptance and positivity, which can help prevent eating disorders from manifesting. NEDA has also articulated that this year’s theme was chosen to highlight that eating disorders don’t discriminate and affect people across lines of gender, colour and sexuality. More than 30 million Americans struggle with some form of eating disorder. Despite their trivialization as a minor issue or a choice, someone dies approximately every hour, directly from an eating disorder. While eating disorders conjure up thoughts of the calorically-deficient Anorexia Nervosa and Bulimia Nervosa, Binge Eating Disorder is the most common eating disorder in the U.S. and can increase the risks of other health issues ranging from diabetes to obesity. Another one that many people don’t know about but some shows have ‘popularized’ as a form of entertainment, Picais the compulsive eating of substances that are largely non-nutritive, including hair, soil, metal and more. Apparently, the disorder is on the rise – between 1999 and 2009, Pica hospitalizations increased 93 per cent, more than any other eating disorder. More forms of eating disorders exist, including those that don’t are more individual in nature, previously categorized as “eating disorder not otherwise specified” (EDNOS), which because of their lack of precedence, can be harder to treat. Given the variety of eating disorders, symptoms and difference in psychological factors in each individual, there is no one-size-fits-all approach to treating eating disorders. Other health issues and complications that arise from eating disorders, like kidney issues for those suffering from Anorexia or heart disease in those with Binge-Eating Disorder, can further change a medical professional’s approach. The Mayo Clinic cites a multi-pronged approach that includes the development of a treatment plan, psychological therapy, nutrition education and medication and hospitalization, if required. There are many similarities in treatment to those with substance abuse issues – in fact, “50% of individuals with eating disorders abused alcohol or illicit drugs, a rate five times higher than the general population.” NEDA cites that as with substance abuse, early intervention in the fight against an eating disorder is essential. Ahead of National Eating Disorder Week, NEDA has launched the Body Acceptance Challenge; encouraging people to “reject diet culture” by accepting their bodies, respecting others and fighting weight stigma. They’ve also partnered with the Mall of America to provide training and support for its guests, tenants and employees. If you head to Netflix right now and type “mental health” into the search bar, nearly two dozen television shows and films will be listed. Try “mental illness”, “crazy” or “insane”, and you’ll return several dozen more. There’s no denying that mental health is a heavily-used trope on the silver screen – whether it’s a character’s quirk or a plot device, its depiction can ultimately become a key influencer on an audience’s perceptions of various mental illnesses or behavioural issues. The dramatization of illness for entertainment is somewhat of a moral dilemma – is it ethically defensible or something that the onward march of progress and sensibility will inevitably show that our shows lacked grace? In today’s blogpost, we’ll take a look at some of the ways that today’s media is impacting our understanding and approach to mental illness. On a brighter note, we’ll take a look at some recent programs that have done a better job than most. There was a swirl of controversy in 2017 after Netflix dramatized the book series 13 Reasons Why into a televised series. The show, narrated in part by a girl who has committed suicide and the boy who loved her, follows her complex plan to achieve justice and understanding for herself from beyond the grave. With its high school setting and cast, critics argued that the show made suicide look cool or justifiable and could be a dangerous influencer on impressionable minds. It’s hardly the first media to do so (remember Romeo & Juliet? From English class) but hopefully, with more voices speaking out, it’ll be one of the last. “Suicide Contagion” is a real phenomenon: exposure to someone else’s suicide in real life or media depicting it can increase your likelihood of considering or committing suicide. It’s important to do what we can to reduce its glorification, especially among younger audiences – it’s among the top five causes of death for adolescents and young adults. More than 20 years ago, a study found that depictions of mentally ill individuals in prime-time television were nearly 10 times more violent than the general population of television characters, and 10 to 20 times more violent when compared to those suffering mental illness in the US population. Since then, the number of TV shows has exploded: in 2017, 487 original shows aired – compared to 182, fifteen years prior. Following that logic, audiences are being exposed to more-and-more instances that depict those suffering from mental illness as violent, unstable and a threat. This creates stigma and it can cost lives: those suffering from mental illness are 16 times more likely to be killed during police encounters and some suggest that stigma might influence the decision to use lethal force. In fact, those suffering from mental illness are more likely to harm themselves than others. These skewed depictions can be irresponsible and can create real life risk for those suffering from mental illness. Marginalizing Medication and Inventing Superpowers: The show’s main character must solve the big dilemma but the medication they take to keep their behaviour in check muddies their gifts. They stop taking their medication, allowing their mind to “clear up” and save the day. While the “disability superpower” trope can be affirming and positive in some cases, depictions that promote medication as a barrier to brilliance are dangerous, particularly to those suffering from mental illness. One of the worst recent offenders: Split, a movie which depicts a man who stops taking his medication, allowing his 23 distinct separate personalities to manifest – one of which literally turns him into an unstoppable, superhuman creature. This is another example of the impact of romanticizing mental illness: depression won’t make your seem smart and brooding but it could make you irritable with digestive issues to boot. Not only are mental health issues not a superpower but medication can sometimes be the only way to live a happy and healthy life. Bojack Horseman: Praised for its “brave depiction” of depression, animated series Bojack Horseman is self-aware and unromantic in its depiction of mental health issues, while still delivering as an enjoyable dark comedy. Crazy-Ex Girlfriend: While “crazy” might not be the most woke adjective to use, the comedy does a good job at depicting mental health issues, beginning with a fatigue-driven crisis that ultimately delivers the show’s main character to the hometown of her ex-boyfriend. Like Bojack, Crazy-Ex Girlfriend delivers without being preachy or using kid’s gloves – it depicts the effects of mental illness as they are, without rose tinted glasses. Homeland: The series, now heading into its 8th season follows Carrie, a CIA operative battling terrorists – and bipolar disorder. Why I’ve included it on the list: early on in the show, we see the split between medicated and unmedicated Carrie – how quickly she loses control of things, including her family and career when she choosing to go cold turkey on her medication. The show also depicts a strong and intelligent person who suffers from mental illness – showing that it doesn’t have to make one less capable of living a successful life. It’s early – you’ve still got a few months to go before the semester is over, at least one before exams and end-of-term essays become a reality. If you haven’t knocked this year out of the park like you might have meant to – relax, regroup and focus on achieving success in your next academic year. If you’re graduating – congratulations! You’ve made it through what most students report is a stressful period in their lives. Now you’ve got some form of accreditation and you’re ready to conquer whatever comes next. Wait – what comes next? Not to mention other social and financial concerns as well. There’s no denying it’s a big change that requires courage, preparedness and a can-do attitude. In today’s blogpost, we’re going to outline some things to keep in mind that can help ensure you feel just as good about finishing school as you did when you were younger and done for the summer. Don’t Leave Your Planning to the Last Minute: This one is probably the most important tip for managing the actual workload of your transition. If you’re behind, don’t panic – see #3. At many schools, campus recruiting season starts in the Fall semester and extends into the Spring semester, with offers beginning in March. If you haven’t already investigated your school’s campus recruiting initiatives, make sure you resume is ready and hit the ground running! Otherwise, there is no better time than the present to begin exploring and applying for job opportunities that commence after graduation. Routine will make you Resilient: We can never be completely certain about what opportunities lay ahead, whether it’s a job offer or a grad school acceptance. Sometimes it’s a pleasant surprise and other times, a bitter disappointment. You can better prepare yourself for success, whatever the outcome by adopting healthy habits now. By creating and enforcing a routine that promotes productivity, health and wellbeing, you’ll be better equipped when you start the next phase of your life, whether it’s your career or starting the new job hunt in earnest. Make sure your routine emphasizes positive financial, organizational physical and mental health habits. Give Yourself a Break: You’re young – most likely in your early 20s. No one expects you to have it all-squared away just yet. More importantly, there’s no age limit on achieving success. In the grand scheme of things, whether you’ve secured a job right out of school or months later will not have any real impact on your career or personal development. Additionally, there’s nothing to be gained from comparing yourself to others – why measure yourself by someone else’s yardstick? You’re not Bound by the ‘Now’: Are you feeling like what you decide to do next will ultimately determine your fate? Relax – a UK study highlights that 19 out of 20 graduates have changed jobs at least once within three years of graduating. In fact, the average worker holds ten different jobs before the age of 40 and the next generation of workers are expected to move around even more. While it’s important that you choose the opportunities that are right for you and don’t accept the next step begrudgingly, just because you feel like you have to, remember that you can use this next stage as the launchpad for great things to come, whether or not it’s your first choice. One of the great drivers of human progress is our incessant need for reason. Not content that lightning flashed across the heavens just because it did, our early ancestors crafted great myths of angry gods. We looked inward too, developing philosophy that explained why we were here and how we should be. When our bodies exhibited symptoms of sickness or abnormality, early physicians pointed to imbalances in the medical humors as the culprit. We’ve come a long way – we know that electrical charges, not deities cause lightning. Our fascination in what the night sky held eventually carried us over the divide and onto the moon. In other quests, like medicine, we’ve also progressed nobly, including on our conceptions of mental health and disorder. Thankfully, we’re no longer using magic spells to ward off ailments of the mind, caused by evil spirits – for the most part at least. Today, we count on the twin scientific fields of psychiatry and psychology for leading the way on studying and solving mental illness and behavioural issues. In Canada, February is National Psychology Month. It’s a time to celebrate the contributions of psychologists and how the profession is helping make the world a better place, through research and practice. In this blog, we’ll outline a brief history of psychology and what a modern-day psychologist is and what they do. As we touched on above, mental illness was blamed on supernatural elements for much of human history; however, some early Greek physicians like Hippocrates, considered the “Father of Medicine”, pointed to physical origins and worked to categorize mental illnesses. Similarly, the association of physical and social factors impacting mental health was being reasoned in other ancient civilizations. Fast forward to the Enlightenment in Europe, the “Age of Reason”. A note: while there were advancements in understanding in the period between across many civilizations, in the European context, the theologically-oriented “Middle Ages” put greater value on religious justification than scientific rationalization. German philosophers like Christian Wolff and Immanuel Kant popularized the discussion of psychology, with the former identifying it as its own field of science. As the scientific method and the need to explain phenomena surged across the continent, the field of experimental psychology – the branch concerned with the investigation behind basic processes like learning, memory and cognition – was being born. While there were some missteps, like the inaccurate and racially-stained phrenology, the realization of experimental psychology can be attributed to Wilhem Wundt, considered the “Father of Psychology”, who founded the Institute for Experimental Psychology at the University of Leipzig in Germany in 1879. Wundt would define psychology as “the investigation of conscious processes in the modes of connection peculiar to them”. From there and from many of Wundt’s students, institutes and laboratories dedicated to the study of psychology would spring up across the world, like G Stanley Hall, the first American to earn a Ph.D. in psychology, who would open up the first U.S. lab at John Hopkins University. Other branches, like psychoanalysis, which counted the well-known Sigmund Freud among its ranks, also furthered the broader field. Psychology began to become a core part of medical and academic curriculums and be adapted into many other disciplines, including military, political and sociological thought. That’s all for our brief overview – thousands more words could be said on the subject. 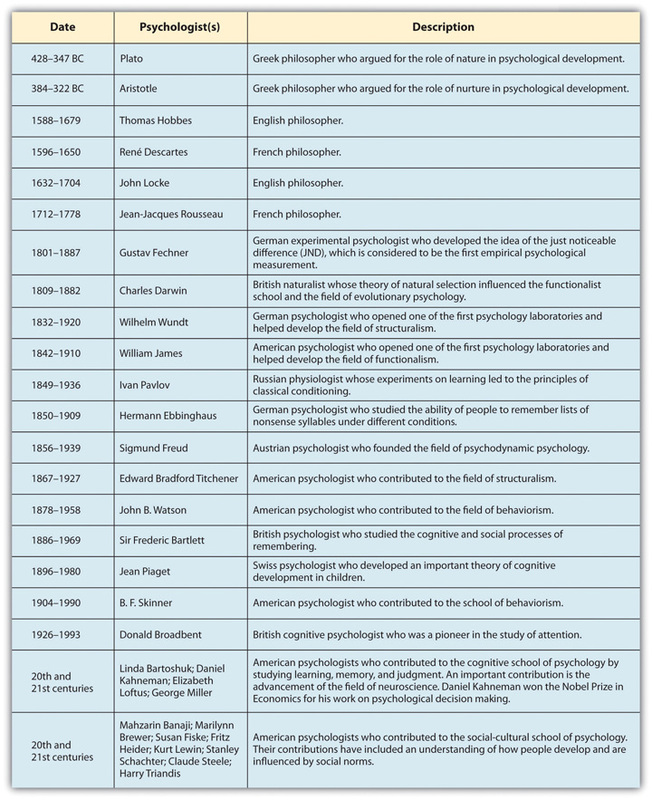 If you’re interested in learning more, check out this list of famous theorists that advanced the field of psychology. Psychology has come a long away in more than a century of formal scientific research and practice. You might be surprised to learn that today, there are a multitude of subspecialty practices, from everything from developmental psychology focused on children to forensic psychologists, focused on criminality. Ultimately, a psychologist furthers their profession by either expanding what is known through research and/or by providing service to those in need. In many countries, including Canada, psychology is a licensed profession through a regulatory body. Given the academically-intensive nature of the career, a significant amount of schooling is required – most psychologists require a master’s and/or doctoral degree in psychology to be accredited. There’s often a little confusion between psychologists and psychiatrists. The key difference is that psychiatrists are medical doctors and are therefore licensed to prescribe medication. However, there are many synergies between the programmes and methods of psychologists and psychiatrists. If you’re trying to decide whether you should see a psychologist or a psychiatrist, you might want to speak to your primary care physician first to get guidance on what may be the best approach for your needs. Plenty of things changed between 1960 and 2005—the 45 year stretch saw the end of paradigm-shifting conflicts like the Vietnam and Cold Wars, ushered in the Age of Internet, and unleashed Pop-Tarts on the world. But one thing has remained the same: in 1960 and 2005, Americans chose February as their least favourite month. It might stem from the fact that it’s the shortest month of the year, or that it’s in the dead of winter, post-Christmas and New Year’s jubilation. But if the month has a redeeming quality, it’s one defined by care, tenderness, and community: Valentine’s Day. The celebration, which is observed on February 14th each year, traces its earliest romantic roots to the 14th century, but it wasn’t until the 19th century that the Valentine’s Day machine kicked into full gear with mass-produced cards replacing handmade tokens. A couple hundred years worth of chocolates, restaurant reservations, and rose bundles later, and Valentine’s Day has become a social and cultural institution in North America and the world over. Traditionally, the holiday is marked for the expression of romantic love—a day where lovers spoil and shower each other with gifts and affection. Such as it is, the holiday can leave single folks feeling left out, even bitter. But this needn’t be the case. Though the day centres love within a couple, it can be turned into an opportunity to show care for anyone in our lives. If we reposition the restrictive marketing around the holiday, we can make it a day to celebrate parents, siblings, friends, and—don’t roll your eyes—even ourselves. Here are some tips for different ways to enjoy Valentine’s Day, and shake off the mid-winter doldrums. In its most popular iteration, V-Day is for lovers. There are the classic accoutrements: flowers, fancy dinners out, flashy jewellery. While these are fine—some will prefer this classic fare!—they can also be a little vanilla; chances are your partner has experienced this kind of thing before. Valentine’s Day, in the old days, required more effort: meals were cooked instead of purchased, gifts were crafted rather than bought. There’s something to be said for the expenditure of effort in Valentine’s planning, because it reflects a certain kind of care and commitment. -Try preparing an extravagant home-cooked meal. Even if it goes awry, it’ll be a good memory, and a fun spark—but keep a backup plan on hand if you’re no culinary whiz. -Get some glue and glitter and construction paper and make a card. Hallmark cards with a non-descript message are nice enough, but handmade ones are better. It might be rough around the edges, but so is life, and there’s nothing more endearing than seeing someone try their hand at something new in the name of love. -Talk with your partner as if it was a first date. If you’ve been dating a while, chances are there will be a lot to say that gets lost in the daily hustle and bustle of life. This can be a fun exercise if approached with an open mind, and it can bring you closer to your partner, too. We tend to think Valentine’s Day activities like gift-giving and displays of affection can only be shared between lovers, but that’s false. Transforming it into a day to celebrate friendships is powerful and fun—Leslie Knope did it on Parks and Recreation with Galentine’s Day, an occasion to salute the women in her life. If a fictional TV character can do it, you can too. -Pretend you’re back in high school. Order some pizza, get a pile of junk food and drinks, and watch movies and play video games. As we get older, it’s rare to spend time doing these things with friends—but these moments are precious and unpressured. Stay up extra late. Maybe you’d rather keep Valentine’s Day a personal endeavour. That’s cool, and kudos to you for putting yourself first. Self-care is important! -This is a general purpose section, so do whatever it is you’d most enjoy. For some folks, a spa day is rejuvenating. For others, binge-watching a Netflix series is the pinnacle of self-love. For others, it’s getting outside and exploring. Take the day to prioritize yourself at each turn, free from the pressures of society. Black History Month is celebrated through February. The month-long observance is meant to recognize significant individuals and events in Black history, and while today it’s a noted international celebration (Canada and the United States maintain Black History Month in February, while Germany, Netherlands, Ireland, and the United Kingdom mark it in October), its origins are considerably more humble. This history is critical precisely because of the people and systems that fought—and continue to fight—to keep it from surviving. Acknowledging these histories, these victories, is to acknowledge resilience and brilliance in the face of genocides both cultural and literal. Black History Month is part of cultivating space and identity and accomplishment in a modern society built on Black subjugation. Black History Month, in popular contexts, is good. In schools, the words and deeds of Civil Rights icons like Martin Luther King Jr. and Rosa Parks are taught, and the evils of segregation and racism are established. While these are critical lessons, Black History Month is an opportunity to dig beyond these cursory teachings, and connect with Black histories outside the spotlights—ones that remain obscured and erased. This means engaging with and researching your surroundings to uncover these histories. In the spirit of encouraging this work and connecting with unsung Black heroes, we’ve highlighted critical figures and events in Black history that have been left out of most history books. Most rock histories will trace rock and roll to the likes of Chuck Berry, Fats Domino, and Jerry Lee Lewis, but they’re overlooking a Black woman who could shred with the best of them. Born Rosetta Nubin in 1915 in Arkansas, Sister Rosetta Tharpe is credited as ‘the Godmother of rock and roll.’ Her mix of gospel and rhythm and blues precipitated the rumble of rock and roll music, and her use of distorted electric guitars influenced British guitarists like Eric Clapton and Keith Richards. The Coloured Hockey League operated from 1895 to 1930 in Canada’s east coast provinces. Black men who traversed the Underground Railroad were brought to safety in the Maritime provinces, where a league was established for them that grew to include 400 players. The CHL is credited with pioneering not just the butterfly style of goaltending (in which a goalie drops down on their pads to make a save), but the slap shot as well. Canadian filmmaker Damon Kwame Mason highlighted this in his documentary Soul On Ice: Past, Present and Future, which notes that the slap shot originated as ‘the baseball shot,’ given the way that the players wound up to swing as they did with a baseball bat. Donald Willard Moore was born in 1891 in Barbados, relocating to Canada in his 20s. He operated a dry cleaning service on Spadina Avenue in Toronto for over 50 years, during which time it became a gathering place and community hub for Toronto’s West Indian and Caribbean communities. In 1954, Moore led a campaign to change Canada’s then-anti-Black immigration laws. His work led to changes in these laws that allowed for the settlement and employment of many nurses and domestic workers from the Caribbean, establishing a community that is now an indelible part of Toronto’s fabric. Children are curious creatures: in a world full of promise, exciting experiences and new knowledge to be gained, who can blame them? As many parents can attest to, explaining the reasoning behind even the common of phenomena to a child can result in an endless slew of ‘whys’ – until you get to a point where even they’re a little unsure of the ultimate answer to it all. That routine isn’t made any easier by the need to provide the explanation in a way that’s elementary enough for the inquiring young mind to understand. Now, imagine having to explain to your child why the man sitting on the street corner is yelling loudly at no one or why grandma can’t remember their name anymore. Given that even adults struggle to talk about mental health with each other, it can seem overwhelming to help your child understand the fundamentals behind what is often, a very complex subject. In today’s blog, we’ll outline several key suggestions and considerations that can help make explaining mental illness to your child less daunting. Structure your answer with the child’s age in mind: This might seem like an obvious one – trying to explain the chemical and genetic theories behind depression to a four year old might result in greater confusion than they initially had. Children of different ages will have different abilities to contextualize what you’re describing with their existing knowledge. For toddlers, focusing on the “concrete information” or the basic cause and effect may be more appropriate. As BC’s Here to Help outlines, simplifying depression as “when daddy is sick, he has difficulty going to work” may be all the detail a young child, needs. Older children and teenagers will be able to understand more and could want more detailed information, so make sure that you’re equipped to help answer their questions. However, don’t be afraid to say “I don’t know” – it’s better to admit that you don’t have the answer than to misinform and mislead. Contextualize mental illness through physical illness: Despite the societal strides in understanding mental health, even today, we tend to treat physical pain as more legitimate than mental illness. While children might not understand the complexities of schizophrenia, contextualizing mental illness through physical pain or illness can be a useful stepping stone to help them understand why someone may be “sick” and demonstrating certain behaviours. Framing it as a part of the brain being sick, like a stomach ache or a throat infection that your young child has experienced can help provide the personal contextualization needed to better understand the symptoms of a mental illness. Don’t stigmatize – educate: There’s a lot of misinformation out there about mental illness; much of it serves to put already vulnerable people at greater risk – whether its getting fired from a job or getting shot by police. As a parent, one of the hats you wear is as one of your child’s educators and it’s important for their sake – and for those suffering from mental illness – that you don’t rely on tired tropes when explaining it to your children. For example, your child might encounter someone with Autism Spectrum Disorder (ASD) in one of their classes. Those with ASD often have difficulty communicating with people and may be more sensitive to stimuli. You would do the child with ASD and yours a disservice if you dissuaded your child from playing with them or if you described their behaviour in negative terms. Help your child understand that people have differences but that everybody deserves to be treated with respect and kindness. Keep the conversation going: There’s a few conversations that a parent ultimately knows they’ll have with their children at some point in time. Despite foreknowledge and preparation, some of us never seem ready to broach the conversation about the changes that are happening in our children’s bodies and what we mean when we say, “the birds and the bees”. Like those conversations, it’s not an open and shut case – the subject matter is too vast and evolving for one discussion. Mental illness, and more broadly, mental health, is just as large and it’s important that we don’t appear to be closing the door on our willingness to discuss it. You could explain what’s happening to someone else but if your child senses that you’re apprehensive or unwilling to discuss it again, who will they turn to if they ever need to talk about their own mental health issues? As a parent, be ready, be there and be proactive on the information and conversations that your child needs to hear. There’s a general consensus around New Year’s resolutions: making them is fun. Sticking to them is not. This wrestle can continue all year long. We want to have the proposed end-point of the resolution, the light at the end of the tunnel, but we falter in executing (or even creating) a plan to reach it. This is why, year-in and year-out, people will chuckle about how soon they ‘failed’ at their resolutions. But it’s not that simple: if every resolution were destroyed each time we got sidetracked, nothing would ever be achieved. We’d do well to remember the motivational posters tacked up in our grade school homerooms: If at first you don’t succeed, try, try again. This is the most important item to remember when setting and working towards your resolution: you don’t need to abandon it if you momentarily fail at it. This is where discipline and commitment will be tested. It’s easier to say, ‘I failed, I’ll do better next year,’ making it next year’s issue and leaving you off the hook for the rest of 2019. But sticking to your resolutions is just that. It requires perseverance, hard work, and a sense of responsibility—not to others, but to yourself. At times, it’s helpful to view a resolution as a technique of self-care. Rather than a rigid, martial, all-or-nothing rule, it’s an annual chance to implement new practices in looking after yourself. This will look different for each person: maybe you wish to be in better shape, or perhaps you wish to up your protein intake and reduce your sugars. You might even just want to keep your workspace clean and organized. Regardless of what the goal is, the most critical difference between a successful or unsuccessful resolution is our ability to commit ourselves to that change. That, of course, depends on how badly we want it. Writer Brandon Stosuy recently described success as “having the discipline to do what you say you’re going to do, when you say you’re going to do it, even if nobody’s watching you, and you’re only saying it to yourself.” This gets at the core of our struggles with new year’s resolutions: unlike at work, in most cases no one will be monitoring our progress or ensuring we complete tasks and hit deadlines. It’s on us to either succeed or abandon our resolutions. Luckily, there are certain strategies that can help you stick to your guns and accomplish your goals for the year. One of these is to do things step-by-step: draw up a game-plan that breaks your resolution down into manageable bits, and cross them off as you go. (Rome wasn’t built in a day, etc.) Another helpful technique is to talk about your experiences with your resolutions. Solidarity and community discussion is a helpful tool for not only pushing us towards success, but assuaging our anxieties about struggling. This public outreach need not be limited to discussion. It’s important to assess when we need help. Although resolutions are largely a personal endeavour, this doesn’t mean we can’t ask for help in attaining them. It is a fool’s errand to push ourselves to extremes in the name of independence. We build community so that we can lean on each other. Sometimes, sticking to your resolution means using a lifeline. New Year’s resolutions can be draining, but they can also be enriching, pushing us to discover more about ourselves and those around us. This year, set resolutions that will encourage you to work year-round to accomplish them, and then hold yourself accountable for them. If you enter next year having made changes, then you’ve stuck to your resolutions. © 2015 EAP Expert Inc.